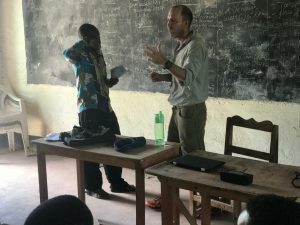 In May 2017 Kurt Davis visited Kakuma to teach an entrepreneurship class. 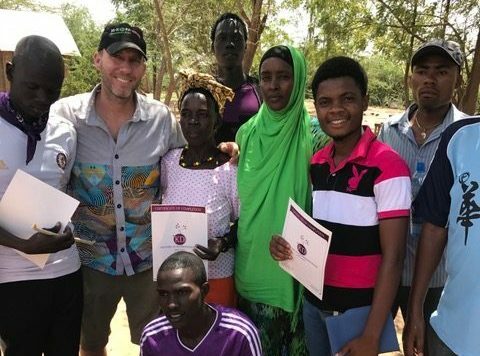 He was traveling Africa for nearly half a year by that time with the goals to visit a refugee camp so to better understand the situation displaced people faced. Luckily during a hike in the Congo, Kurt met Aurore Vermylen who said she had a way Kurt could visit Kakuma. 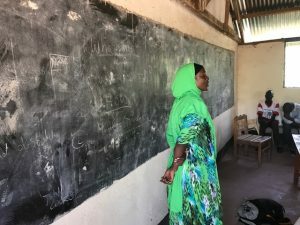 Aurore frequented Kakuma to research her Ph.D. During these times she became friends with Innocent who was from Congo and worked with French-speaking NGO’s. Aurore introduced Kurt to Innocent who played a bit tough at first asking “what will you offer to the refugees?’. Kurt said he could teach an entrepreneurship class. So Innocent agreed to host him and organized the class. It all started from there. Innocent organized a workshop and invited over 120 people who joined from across the camp to attend the 3-day, 4-hour per day workshop. The attendees were men and women from Somalia, Congo, Ethiopia, Sudan, Burundi and South Sudan. What was surprising is that Kakuma had a small business community already with food shops, mini-hotels, coffee shops, and electronic stores. Many were already thinking of or had actually started businesses with limited means. It was clear they were entrepreneurs-in-action. It was impressing and prompting to help. They just needed a small boost to get them going. “Could I help at all?” Kurt thought. The first day was very hot, so hot that bottles of water were ordered for everyone. Idea creation was covered, forming teams, brainstorming ideas, and teamwork. By the end of the day, there were teams and each team had a business to pursue. On the second day, the class dived into strategy, planning, and making a business plan. Many of the participants had an AHA moment starting to realize that getting these businesses started were easier than expected. But that day, we had a small rift. One of the students vented: “our biggest problem is access to capital. We have no money to get our businesses going. It is always the problem here.”‘ Kurt responded defiantly, “‘what money do you need? Did you try to raise money? Do you know how much money you actually need? I bet you don’t need it.” The student did not like this response and repudiated, “I don’t think you understand what we face here. 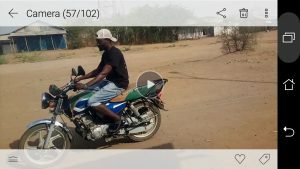 You should be sensitive to the surroundings and ask us these questions before you begin.” Again, Kurt did not acquiesce “‘I’m here, I’ve been in Africa half a year. I get it but I’m not here to sympathize, I’m here to show you how to do this. And you know what, it’s not that different from other parts of the world, even parts of America. You have everything here: people with capital running small businesses, community resources, and human support. Let’s evaluate this during tomorrow’s financial planning session and we will calculate how much capital you need. I bet we can start all of these businesses.’” The student still was not convinced but he agreed to stick it out. That discussion was challenging – how to give the Refugees a boost? How much money is actually needed to start these businesses? Per 4, Kurt could raise money from outside by launching a website and online funding page. What was most intriguing to was that everyone wanted capital raising to be a legitimate business lending / investing operation – no handouts. They will repay the investments so that they would receive larger investment in the future. They just wanted to be business people and earn their living. So the commitment to start a fund, a venture capital fund that will seed these businesses. All were excited. That was the birth of Kakuma Ventures – the first venture capital fund focused on financing businesses started for and by displaced people. Where peoples are, there solutions are founded. From nothing, in term of the cash money,the initiative may bring answer as solution on the problem created by the absence of cash money. 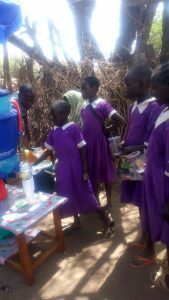 Something like kakuma ventures was in the mind of refugees in kakuma refugee camp. but how to start it and how to organise it, those were the questions sourunding in the thoughts of Innocent. By connection Innocent reached Kurt through Aurore…. And then all started there: From nothing to something…. just from the outlook on how kakuma venture was formed. All the above mentioned thoughts and questions were actually what we were asking Kurt and ourselves, how to get the start up capital? because business ideas are (were) indeed there. KURT struggled to convinced us and at last he actually did. It is now becoming a great flat form.